EduPub is the imprint and trademark of Edupedia Publications Pvt Ltd. We publish books, book chapters, research papers and conference proceedings. 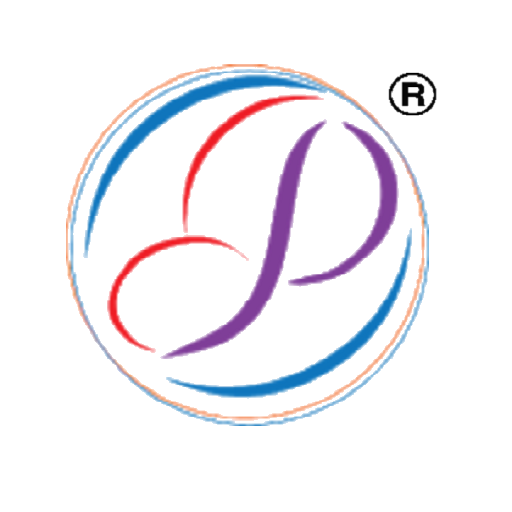 The INTERNATIONAL JOURNAL OF RESEARCH is a peer-reviewed journal published monthly by Aesthetic Journals (https://edupediapublications.org/journals/index.php/IJR). IJR is dedicated to increasing the depth of the subject across disciplines with the ultimate aim of expanding knowledge of the subject. We invite you to submit your manuscript(s) to editor@edupediapublications.com for publication. Our objective is to inform authors of the decision on their manuscript(s) within four weeks of submission. One key request of researchers across the world is unrestricted access to research publications. Open access gives a worldwide audience larger than that of any subscription-based journal and thus increases the visibility and impact of published works. It also enhances indexing, retrieval power and eliminates the need for permissions to reproduce and distribute content. IRJAET is fully committed to the Open Access Initiative and will provide free access to all articles as soon as they are published. 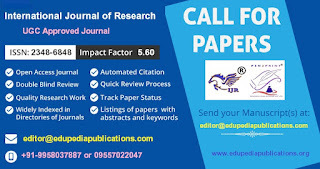 International Journal of Research - IJR is a Double blind peer reviewed international journal for engineering research, engineering science, applied engineering and all engineering related fields. IJR is the unit of Edupedia Publications Pvt Ltd.
Fast & Easy paper publishing process. IJR provides “Hard copy of Journal” to Authors. IJR provides individual "Hard copy of Certificate” to all Authors. Universities, Colleges, Institute, etc. can subscribe the hard copy of the magazine in annual basis. IJR is a scholarly open access online journal which helps to researcher as well as student community. 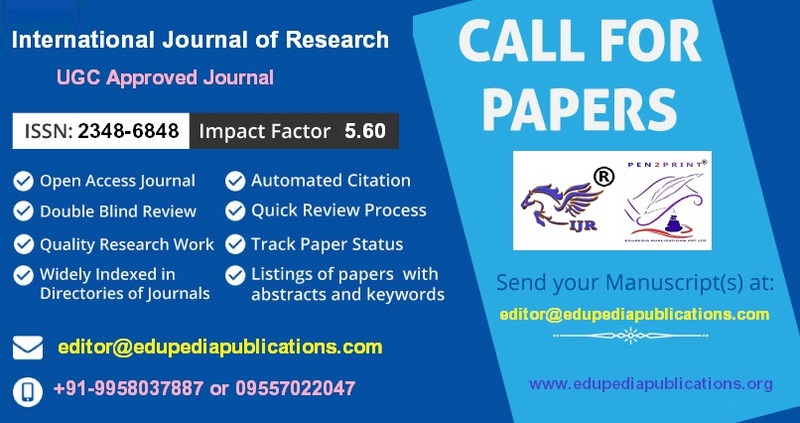 IJR provides the opportunity to the academic researcher and industry for the submission of original research papers in various engineering discipline and technologies. The core of the vision IJR is sharing the innovative ideas and current trends in engineering science. In every year majority of the research works get lost due to lack of effective scientific archival systems but IJR provides speedy and effective archival system which makes high opportunities for research people, corporate people and research scholars to present ongoing research and development in various engineering areas. Frequency: 12 issues per year. 1) Reading and googling a lot of technical papers. There are a lot of journals and IEEE papers floating around in net. 2) Go to one or more conferences, listen carefully to the best talks, and find out what people are thinking about. Read everything that might be relevant gives you different perspective of the focus topic. But be selective too, for not getting to much deviated from you topic of interest. Getting used to simulation software is much useful for simulating your work. You can find a lot of time during the days and utilize those holidays & free days. One of among the tough nuts to crack is to understand the paper published by others. The easiest way is to is by reading it many times. The more times you read the more will be revealed to you. Keep the Internet handy so that you can crack the jargons and terms, which you may find strange. Write down speculations, interesting problems, possible solutions, random ideas, references to look up, notes on papers you've read, outlines of papers to write, and interesting quotes. Read back through it periodically. Keeping a journal of your research activities and ideas is very useful. Now you can identify important open problems in your research field and also you will be very much aware of what you are doing and what you have to do. The more you go, you'll notice that the bits of random thoughts start to come together and form a pattern, which may be a bright enough for a good paper. Please don't pick overly ambitious topics; instead identify a realistic size problem. Gather the Matlab files available in the Internet that is related to your topic and simulate it for the claimed results. Please don't expect the Mfiles readily available for a solution published in a paper. But you can make it of your own by modifying and adding. Believe me, Matlab is a very easy tool! Once you are able to get the simulated outputs of your solution, you can carry on for making a paper out of it. The essence of your work can be diagnosed by analyzing below listed points. We can increase the maturity of the paper by improving these. Significance: Why was this work done? Did you solve an important problem of current interest or is it an obscure or obsolete problem? Originality/Novelty: Is your approach novel or is it tried-and-true? Did you need to develop new tools, either analytical or physical? Completeness: Have you tested a wide range of scenarios, or is this just a simple proof-of-concept? As a part of your paper publication, you can start documenting the 'existing techniques' from the scrap journal you did during the studies. Here you have to extract what all are the techniques existing as a solution for the particular problem and the pros and cons of those. Next, document the 'introduction' about what is the topic and what you are going to do. Better to keep it short. Follows your contribution and the simulated results. 'Abstract' is one section you can work on in the last, as it has to cover the all the sections very briefly. Please note that Abstract makes the committee members to decide whether or not to read your paper. Generally four lines are sufficient for this. The divide-and-conquer strategy works on a day-to-day level as well. 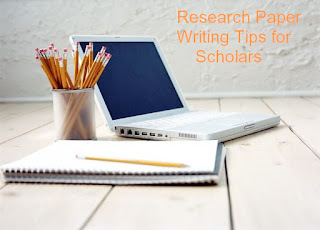 Instead of writing an entire paper, focus on the goal of writing a section, or outline. Remember, every task you complete gets you closer to finishing your paper. Now your paper is ready. You can ask your peers or professors to review your paper. Next is to find the right place to publish it. You can start of with national level conferences, which often gets conducted in many universities. Then once you gain a level of confidence, you can proceed to international conferences and journals. * Accept: "Which almost nobody gets," she says. * Accept with revision: "Just make some minor changes." * Revise and resubmit: "They're still interested in you!" * Reject and resubmit: Though not as good as revise and resubmit, "they still want the paper!" After reading the review the first time, put it aside. Come back to it later, reading the paper closely to decide whether the criticisms were valid and how you can address them. You will often find that reviewers make criticisms that are off-target because they misinterpreted some aspect of your paper. If so, don't let it get to you -- just rewrite that part of your paper more clearly so that the same misunderstanding won't happen again. It's frustrating to have a paper rejected because of a misunderstanding, but at least it's something you can fix. On the other hand, criticisms of the content of the paper may require more substantial revisions -- rethinking your ideas, running more tests, or redoing an analysis. If your paper is rejected, keep trying! Take the reviews to heart and try to rewrite the paper, addressing the reviewer's comments. "Remember, to get a lot of publications, you also will need to get lots of rejections," says Edward Diener, PhD, editor of APA's Journal of Personality and Social Psychology: Personality Processes and Individual Differences. * National Conference: A conference is the right place for beginner scholars, since the level of scrutiny is minimal. The conferences will accept papers which details about the comparison of existing technologies, mathematically proven but practically unproven proposals, etc. * International Conference: A conference is the good play ground for Intermediated scholars. This mostly same as National Conference but the securitization will be more. Conferences offer rapid time-to-publish, plus you will often get feedback on your work when you present it. * Journal: Journal papers are generally the Alfa and Omega of publishing papers and they are considered as more prestigious than conferences. Publishing a research paper involve many steps which involve research work, research analysis, report & documentation and publication. Before these steps we have to do preparation of experiment which involve what to do & how to do. To perform this step we need the guidance from our professors guides, expert in their field and sometime internet is also very useful for the preparation of the research work / experiment. Now after completing our preparation we know our topic, background of the selected topics characteristics of involved components and factors. Now we can move further steps. In every step we have to be very careful because the methods and there factors are going to give result. We have to be alert at the time of result and note down the readings carefully .Method of experiment must be very clear to perform our experiment. 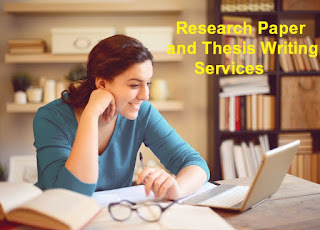 Documentation and publication is also very important the short from of the research report is called research paper in the research paper its involved title authors detail, abstract, keywords, introduction, literature review ,method of experiment result and dictation consolation future work acknowledgment and references . HOW TO PUBLISH A RESEARCH PAPER? Edupedia is the encyclopedia of education. Education is what I studied in school and in my under graduation and post graduation colleges. But, a little thought about the topic and a lot more comes to my mind. There are two kinds of education, formal and informal. The former is what I just defined and is known to all. It is the latter that often goes unnoticed. Infact, it is the informal education that makes or breaks us. Surprising? Let's explore how. Informal education starts from the time a child is born. The child is like a clean slate. His future depends on what his surroundings shall be like, what his parents shall be like, what they shall teach him, what they want him to become like, etc. The first class that a child goes to is at his home. Edupedia Publications Pvt Ltd is an International Scholarly Academic Book Publisher based in Delhi, India. We have been publishing books and research papers and helping scholars in getting published, help them in writing, editing, proofreading and preparing books for publication. 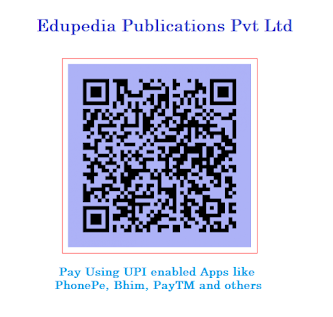 Books published by Edupedia Publications Pvt Ltd can be found on Google Books, Amazon and others online platform. 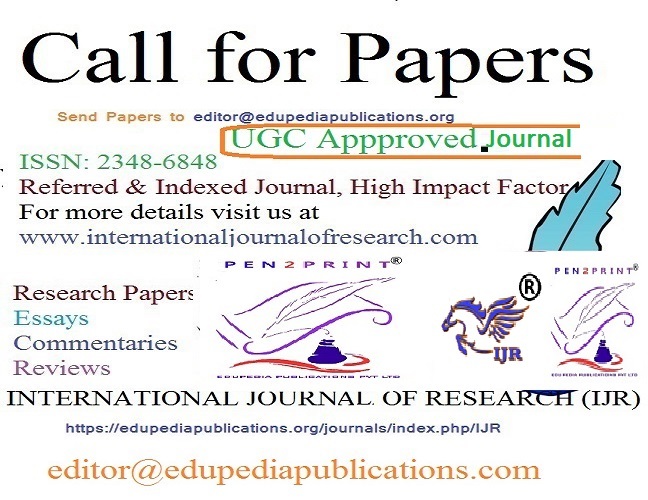 International Journal of Research is ISO 3297:2007 certified open access and peer reviewed refereed international Journal. IJR invites articles that illustrate research results, projects, surveying works and industrial experiences that describe significant advances in the areas of Engineering, Technology, Science and Mathematics. INDEXING: NASA Ads, ArXiv, ANED (American National Engineering Database), EBSCO Host, Cabell’s Directory, DOAJ, NCBI (US National Library) etc. International Journal of Research aims to cover the latest outstanding developments in the field of all Engineering Technologies & science. 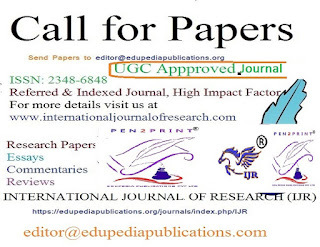 International Journal of Engineering Research and Applications (IJERA) is a team of researchers not publication services or private publications running the journals for monetary benefits, we are association of scientist and academia who focus only on supporting authors who want to publish their work. The articles published in our journal can be accessed online, all the articles will be archived for real time access. Our journal system primarily aims to bring out the research talent and the works done by sciaentists, academia, engineers, practitioners, scholars, post graduate students of engineering and science. 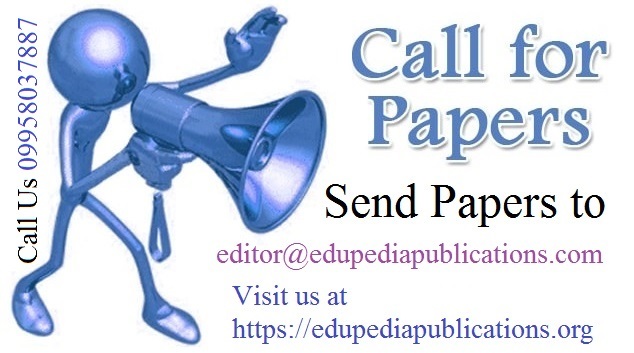 You can submit your manuscript by simply mailing on editor@edupediapublications.com in MS Word format. 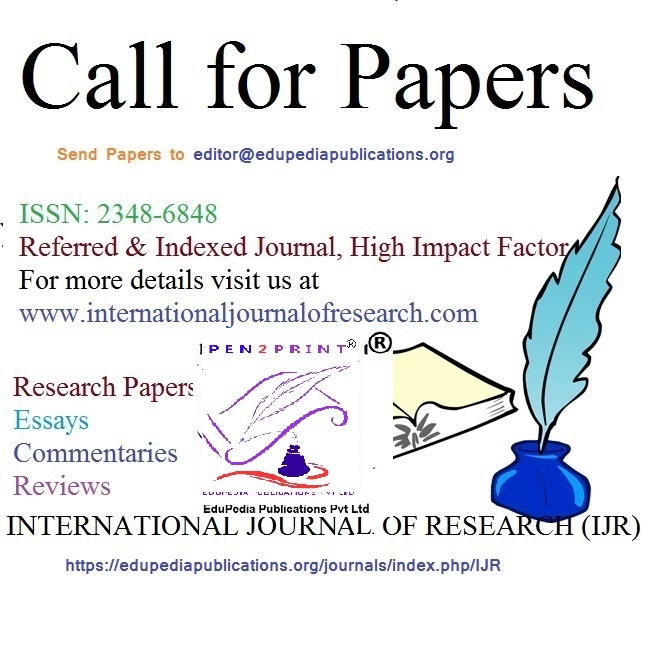 INTERNATIONAL JOURNAL OF RESEARCH (IJR) ISSN 2348-6848, invites you to submit research paper for publishing in Volume 3, Issue 6, April 2017. Expected Date of Publication: Within 2 Hrs after completing all the formalities. All manuscripts are subject to rapid peer review. Those of high quality (not previously published and not under consideration for publication in another journal) will be published without delay. For the May 2017 issue, we would like to invite unpublished research papers, review papers, interviews, and book reviews related to language, literature, social studies, science and technology. Ø All research papers should ideally follow the 7th edition of MLA citations. Ø All research papers should be accompanied by a one-paragraph long abstract, at least ten keywords, and a brief bio-note of the author containing institutional affiliation and basic contact details. 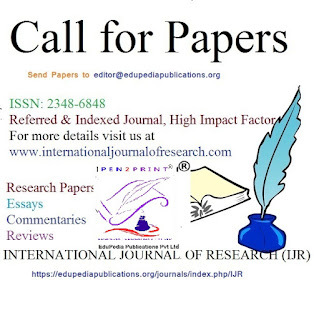 Ø Please visit https://internationaljournalofresearch.com/ for detailed submission guidelines. Ø The last date for submissions is 30th May, 2017.
International Journal of Research (IJR) encourages interpretative criticism, fresh insight into new and established literary/linguistic areas and seeks to entertain meaningful pursuits of different contemporary academic issues. It also encourages original contributions in the form of poetry. Each issue contains essays on major works of literatures in English in the global perspective. The journal will be pleased to invite articles on the literatures in English of Australia, Canada, the Caribbean, New Zealand, Africa, South Africa and South East Asia. Emerging issues in the Indian scenario viz Indian literature in English, regional literatures, literatures in Modern Indian Languages, reinterpretations of classical literature, Dalit Literature and comparative literature are also invited. 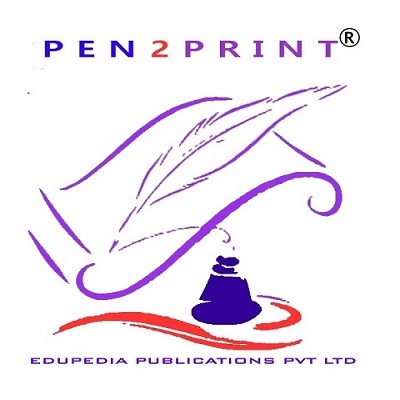 are Trademarks of Edupedia Publications Pvt Ltd.